Just about every restaurant menu features a hamburger. While some places make thoughtful tweaks, others are content to produce uninspired margin boosts. In the interest of seeing that latter trend fade, some extra care went into selecting an eatery for us to dine at on a Friday not too long ago. 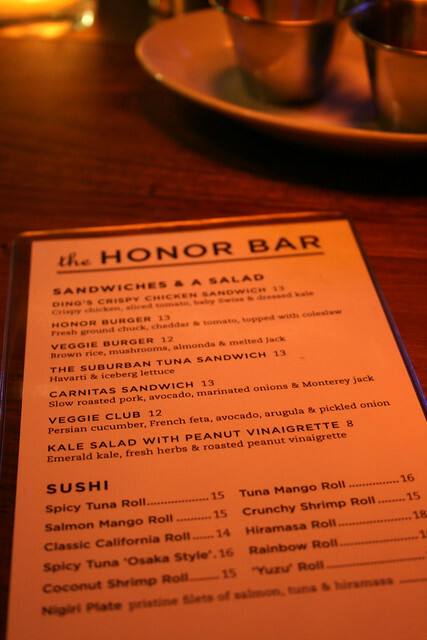 Beverly Hills is rarely in my sights for cities to eat burgers, but after a little research on the best burgers in LA, the Honor Bar, square in the heart of the city, emerged as a prospect for the evening. We headed to the intersection of Wilshire Boulevard and South Beverly Drive to try on the appropriately named Honor Burger. The Honor Bar is the sidecar to South Beverly Grill—a restaurant affiliate of the Hillstone Group, which is responsible for one of the better burgers I’ve reviewed at Houston’s—with a deep, engulfing feel anchored by its sleek wooden bar and corner side griddle à la Hinano Café. All signs gave out that this burger would be a veritable contender. The four of us took consecutive seats down the bar and gave the menu* a brief glance before placing our orders: four medium-rare Honor burgers with respective libations to wash ‘em down. Ding! Our meals were up swiftly; halved and toothpicked arriving splayed out on pastel-colored ceramic boats. Fries arrived separately in julep glasses. 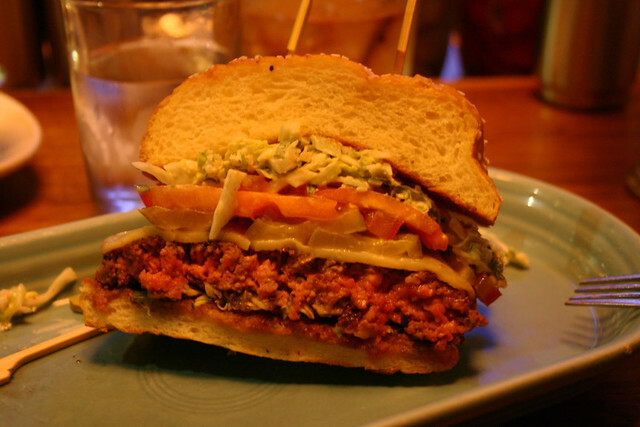 Each burger was demonstrably pink in its core and the sensible application of coleslaw lent color to the mouth-watering portrait. It only took a couple of bites to realize that this burger was solid—the praise for it seemed warranted. The ground chuck was perfectly seasoned and cooked. The coleslaw gave a little flare without being flamboyant or cloying. Nice texture and great depth of flavor delivering everything we were expecting for a somewhat pricey thirteen dollars. Certainly a good meal, the ingredients were simple and well-presented—better than most—as classicism was upheld at the Honor Bar. They owe a lot to other places in LA though, even if they perfected it more, but without a unique signature they are only serving a solid, enjoyable burger. * The menu was unique; it pit classic sandwiches (“and a salad”) against sushi.